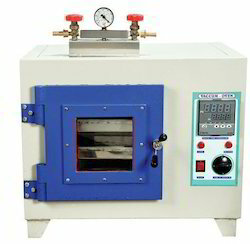 Rectangular Vacuum Ovens are made from heavy gauge material & it is rectangular in shape with full toughen glass window to view sample. Double Wall Construction, Inner chamber made of Stainless Steel- 304 grade with Exterior CRCA Steel with Powder coat finish. Inner made of Stainless Steel - 316 grade and Exterior of Stainless Steel - 304 grade in GMP MODEL. Two valves, one for evacuuming and other for purging/flushing. Vacuum levels are controlled upto 760 MM/Hg. Food grade Silicon door gasket and highly aligned sturdy door fitting. Toughened glass window allows clear observation of load. Non perforated Stainless Steel trays. Temp Range : 50oC to 200oC. 100 Sensor with + 2oC accuracy. Looking for Laboratory Ovens ?